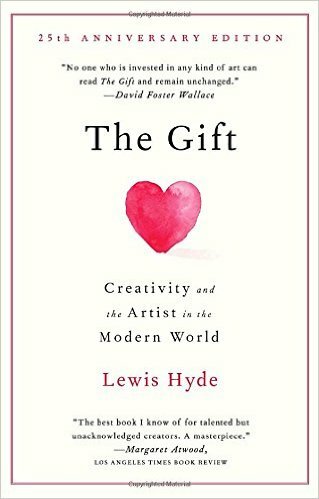 I had an essay already written and all typed up for this month’s newsletter when I began reading The Gift: Creativity and the Artist in the Modern World by Lewis Hyde. (Thank you, Carol, for the introduction to this book.) Reading it has been so transformative that I felt like I needed to shelve my plans for this month and write about it. I have been really struggling lately with my plans of making a living as an artist and the reality of doing so. This book has helped me to understand why this has been such a struggle. Hyde describes two different economies: the commodity economy and the gift economy. In the first part of the book, he delves into anthropology and history to describe the development of both. But, my basic take-away from the first part was this: I have participated in a commodity economy for more than 25 years. From my first minimum wage job at 14, through salaried work and now highly-paid but still hourly consulting work, I have been able to directly equate one hour of work with a certain amount of pay. Art doesn’t work this way. An artist participates in a gift economy in which she or he receives a gift of artistic talent or inspiration and then creates a gift by making the art. The artist gives the gift to the world and is compensated indirectly through another gift. It’s a circle that continues but one in which there is no way to directly correlate hours worked with a ROI. To say that this is a foreign concept to me is a complete understatement and I’ve realized I have to completely shift my thinking about what it means to work and about compensation. I have no idea yet how to do that, but it does help explain why this hasn’t been working.